Earlier this year on Feb. 20th I had some photos and talked about Terry Taube’s artwork at Kona Coast Shopping Center. 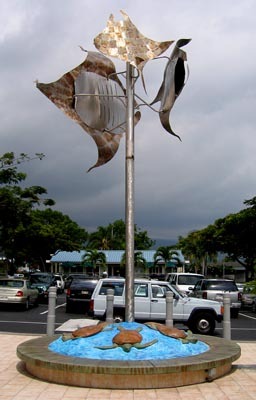 Back then it wasn’t finished as there was just a plain pole sticking out of the center of a circle of Honu. Well, Terry dropped by the shopping center this morning and finished much of the installation with the addition of three steel Manta Rays overhead. So the scene is supposed to be like you are underwater. Pretty cool artwork. It might not be finished as it looks like the post may still need some finishing. I assume the Manta Rays are secure up there as I can see their wings moving in the breeze like they’re swimming which is a nice effect. As I had predicted I have seen kids playing on the honu at times.